You've scored some well-earned vacation time, and you're booked for a week or two at the finest resort you can find. Time to check in, unpack, and ... order room service? A larger TV? Five-diamond hookers? 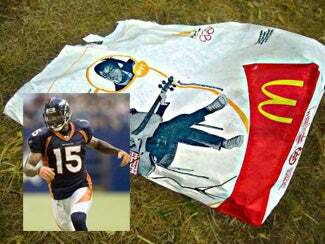 Well, no; if you're Denver Broncos wide receiver Brandon Marshall, it's time for a McDonald's run! But be careful where you leave the bag. In what could be the greatest injury excuse since Jeff Kent "slipped and fell while washing his truck," Marshall injured himself on Saturday after, he says, slipping on a McDonald's bag while vacationing in Orlando, Fla.
Marshall, who had a 102 receptions in his second season with the Broncos last year, said his arm went through a TV entertainment center as he tried to brace his fall after slipping on the bag at the Westgate Lakes Resort. Along with the cast, Marshall also received stitches in his arm, but he did not know how many, according to the Internet report. Has no one learned from the mistakes of Marcus Vick?